Coloring Diva's Mandalas: 50 Mandalas with a Difference! What a great little coloring book! I was expecting to find the usual mandalas inside, but was totally blown away by the fun pictures within each of the 50 images that weren't always that obvious to see at first glance. You can cheat of course, and get some help from the titles, and I did have a giggle over some of them! So many mandala coloring books have flower themes, but this didn't, and every part of the image was more than big enough to color, unlike some of the other books I have bought like this. I also loved the inspirational quotes written on the opposite page of each mandala. I certainly wasn't expecting that, and it gave the book a nice touch. All in all, I really liked this book as it wasn't the normal run of the mill coloring book and I had a lot of fun using it. I am now looking forward to the next book in the series! It's an art therapy book filled with different designs to help with meditation, inspiration, stress and relaxation, or even for occupational therapy to encourage fine-motor skills for those who have had a stroke. Our adult coloring book is very different! 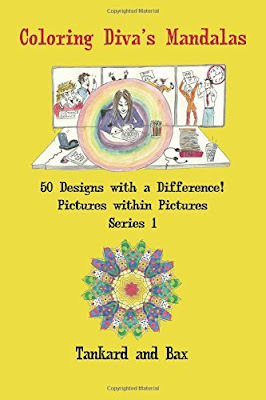 It is a fun, interactive book where you can look for additional pictures within each of the 50 beautiful mandalas to color. It is also coloring book with quotations to help de-stress, chill out and inspire. 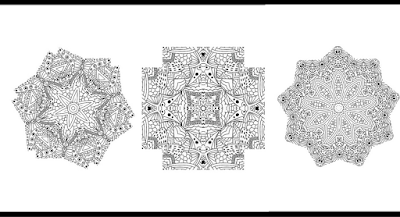 Perfectly sized for travel, trains, planes, camping trips ... but still maintaining the integrity of the image, this pocket-sized coloring book of beautiful mandalas will help with mindfulness and meditation, memory and mellowness. And if it doesn't, at least you will have had fun finding the pictures and coloring the mandalas! We've left the reverse of these coloring pages blank for another reason. As mentioned, they're designed for colored pencils. But if you are going to use any other medium (you rebel you! ), then it won't matter if it bleeds through a bit on the other side, you won't spoil the next design. However we would suggest that you put a piece of card between each design when you're coloring in if you are going to use "alternative coloring equipment"! So, it doesn't matter if you don't know a mandala from a margarita! Welcome to the most fun you can have with your clothes on. Welcome to the wonderful world of coloring books for adults and our mandalas to color!